If you have that “I can’t wait to take these off!” feeling, Foot Glide is the perfect product for you. 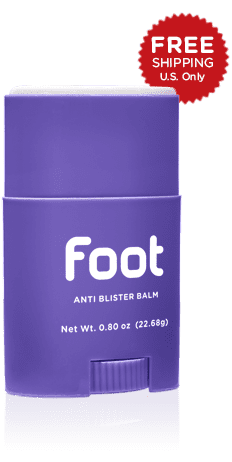 Our balms have always been great for feet, but Foot Glide is specially formulated to protect feet from shoes that irritate toes, boots that chafe, and high heels that cause blisters. Blisters from shoes are the most oft reported injury from runners, marathoners, and athletes all over the world. But, blisters from shoes are not just sport specific, they can happen to anyone. A long day at work, a brisk walk in a new pair of shoes, or that one pair of high heels that you love can all cause blisters. Anytime you have enough friction in a focused spot blisters will occur. Friction between your feet and shoes can develop through a combination of a few variables: pressure, heat, and moisture. If any of these are present for sustained times chafing, blisters and irritation will occur. Foot Glide is specially formulated to remove these variables providing a comfortable environment for your feet keeping them free from irritation. Keep your feet feeling and looking good. Boots, sandals, flip flops, dress shoes, running shoes and stilettos- whatever shoe you wear Foot Glide gives your feet all day protection. Just one application lasts all day. And unlike other products that use greasy and messy products like oil, lanolin and petroleum all of our products are made with 100% natural ingredients, that will never stain your shoes. Foot Glide was specially developed with Apricot and Comfrey Leaf extracts so it moisturizes while it protects, giving you all over protection and prevention from blisters from shoes. Protect your feet before trouble starts and you’ll never have that “I can’t wait to take these off!” feeling again. Try Foot Glide Today! Read our in-depth articles for Preventing Foot Blisters and What Causes Them in the First Place.